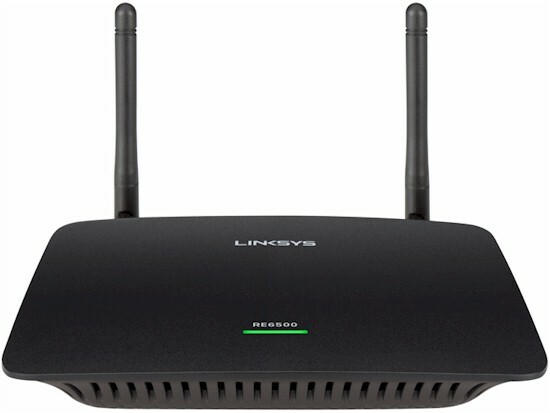 Linksys's newest top-of-the line wireless range extender, the RE6500, probably has one of the longer official product names I've seen: Linksys RE6500 AC1200 Dual Band Wireless AC Range Extender 2.4 GHz and 5 GHz. But the name does provide an accurate description of the product. The RE6500, as we'll refer to the product going forward, is an AC1200 class wireless range extender that supports maximum link rates of 300 Mbps in the 2.4 GHz band and 867 Mbps (which Linksys rounds up to 900 Mbps) in the 5 GHz band. The chart below summarizes Linksys' current wireless range extender lineup, with the RE6500 occupying the top-of-line slot. Traditional single band wireless extenders work by receiving a signal and then rebroadcasting (repeating) it. Not only does this add latency to signal, it doubles the bandwidth utilization on the channel and results in a 50% retransmission penalty. Similar to the NETGEAR EX6100 AC750 Range Extender Tim reviewed earlier this year, the Linksys RE6500 has a "Crossband" feature, similar to NETGEAR's "FastLane", that uses the radio on one band as the "backhaul" to the router while the other radio provides extended coverage to wireless clients. Crossband is enabled automatically if you have created connections on both the 2.4 GHz and the 5 GHz band to your dual-band router (or AP). The graphic below, provided by Linksys, shows how this works. This graphic was originally for the RE4000W, an N600 extender, but the concept is the same. The only difference is that the link rate would be shown as 900 on the 5 GHz band for the RE6500. The callout diagram below shows the top, rear and bottom of the RE6500. The single top panel power light shows the status as indicated above. There are no LEDs to show connection/data for either wireless network. The rear panel has a power connector, a WPS (Wi-Fi Protected Setup) button, four Gigabit Ethernet ports and an Audio jack. The four Gigabit ports are bridged to your LAN, and you can use them to connect gaming consoles or legacy devices that only support wired Ethernet. You can connect the audio port to your sound system or powered speakers and stream music through the wireless extender using supported players.